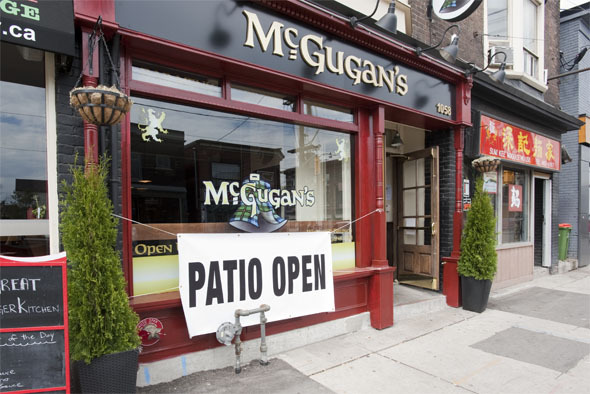 Mcgugan's Fine Scottish Pub at Gerrard at Jones enriches Leslieville with a handsome outpost for Highland flavours and libations. 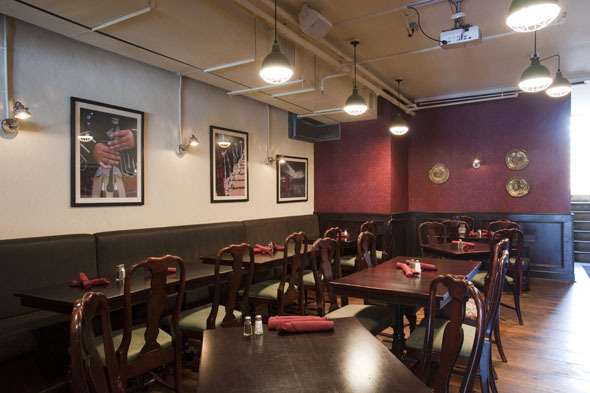 The trio of owners includes chef Bryan Burke and husband and wife team, Ted and Mary (maiden name McGugan) Koutsogiannopoulos, who also own two adjacent restaurants; the Great Burger Kitchen and Aprile Bambina Cucina . Swaths of deep red, exposed brick and dark wood furnishings play into the traditional pub setting though there's nary a tartan in sight. The bar upfront is stocked with 12 taps of craft or Scottish beers, as well as 50 or so single malts, including some quite rare bottles of Dun Bheagan and a chocolatey Glengoyne. 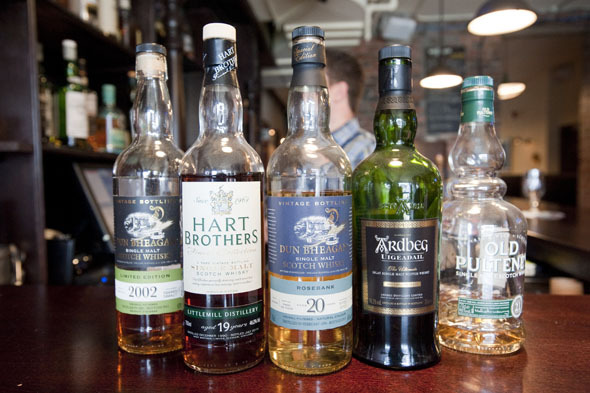 If you don't know where to start, try one of feature drams or ask Ivan behind the bar for a recommendation and watch his face light up as he speaks passionately on the subject. On the menu are the usual suspects of Scottish fare offered as bite sized morsels for sharing. There's battered Haggis Balls ($5.95) with hot mustard and single malt aioli, as well as, Scotch Eggs ($8.95) with brown sauce. Though I have no complaints, I'm intrigued to hear talk of changing up the egg dish in time for summer to a lighter, unfried deconstructed variation. 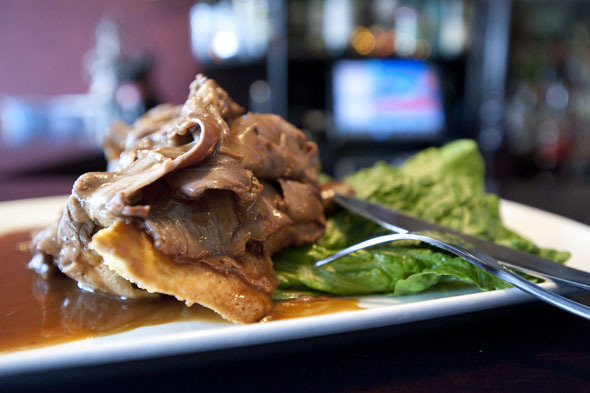 The signature dish is the McGugan's Beef Sammie ($9.95), featuring shaved roast beef over slabs of Yorkshire pudding, topped with rich brown gravy and horseradish mayo. 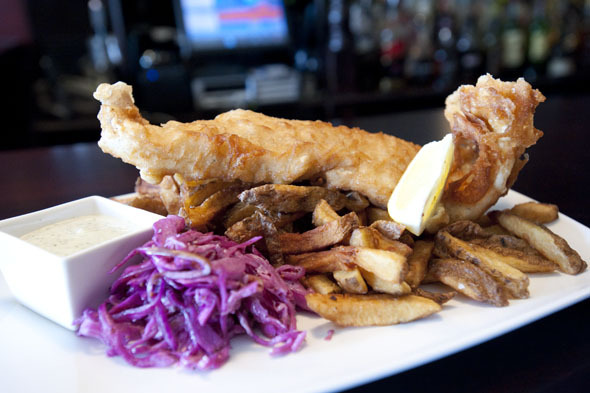 The Fish & Chips ($14.95) is the clear favourite at my table. Commendable for its golden, stout battered exterior that is remarkably crisp while the inside is delicately flaky and moist. Along with generous sides of fries and red cabbage slaw paired up with a pint of Tennent's lager make for a super satisfying combination. In addition to the spacious back patio, there's also a roof top patio and second floor dining room dubbed 'the kilt' that hosts weekly events like board game nights, comedy shows and tutored scotch tastings. Of course the joke is that everything on the first floor (including live music on Fridays) happens under 'the kilt'.